Massey Hall, Friday, June 29 and Saturday, June 30, 2018 at 8 p.m.
Tickets on sale to FriendsFirst on Tuesday, December 5 at 10 a.m.
Tickets on sale to American Express Front of the Line on Wednesday, December 6 at 10 a.m.
Tickets on sale to the GENERAL PUBLIC on Friday, December 8 at 10 a.m.
(TORONTO - December 4, 2017) – Canadian music icon and Massey Hall legend, Gordon Lightfoot will be the final artist to perform at Massey Hall before the Revitalization Project closes its iconic red doors from Summer 2018 through Fall 2020. Widely regarded as the dean of Canadian singer-songwriters, Gordon Lightfoot will end this chapter of the Grand Ol’ Lady of Shuter Street’s remarkable 123-year history with back-to-back performances on Friday, June 29 and Saturday, June 30. Tickets go on sale to the General Public on December 8, 2017. Lightfoot, who celebrates his 80th birthday in November 2018, refers to Massey Hall as “these hallowed grounds” and went on to say, “Massey Hall is home. These shows are a constant fixture for me. They anchor me, and we are glad to have been invited to be a part of its history”. He returns to Massey Hall backed by longtime bass player Rick Haynes, drummer Barry Keane, keyboardist Mike Heffernan and newest recruit Carter Lancaster on lead guitar. He continues to perform extensively throughout the United States, Canada and in 2016 he toured the UK for 11 concerts which included the illustrious Royal Albert Hall. Gordon Lightfoot has won 15 JUNO Awards and has been nominated for five Grammy Awards. He was inducted into the Canadian Music Hall of Fame in 1986 and the Canadian Country Music Hall of Fame in 2001. In May 2003, he was made a Companion of the Order of Canada and is also a member of the Order of Ontario. In 2004 he was inducted into the Canadian Songwriters Hall of Fame, and in 2012 into the U.S. Songwriters Hall of Fame. 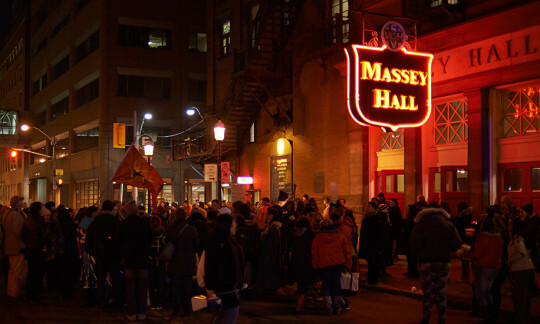 The Massey Hall Revitalization: a seven-year multi-phase project, will result in the full restoration of both the exterior and interior of the building, and a new addition connected to the south of the National Historic Site. The expanded footprint will provide much-needed space to enhance artist and patron amenities, and render the building fully accessible. The Revitalization also marks a commitment by the Corporation to continue to invest in artist development, education, and audiences, and embrace technology as a tool to enrich the ways Massey Hall is experienced. The Massey Hall Revitalization will ensure the hall’s continued contribution to the lives of Canadians through arts, employment, and cultural celebration, for generations to come. 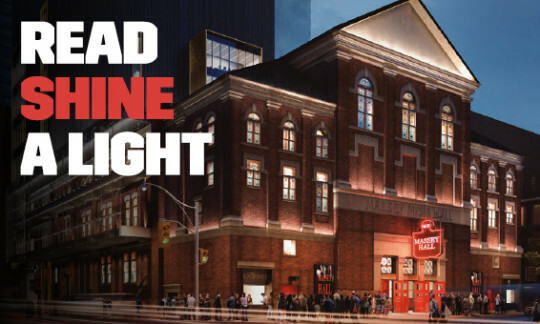 For more information, visit: www.masseyhall.com/revitalization.